Hero Arts | Christmas Cactus Cards. Video + Giveaway (now closed)! Hello everyone and thank you for stopping by! We are having a Launch Party Blog Hop for Hero Arts to help celebrate the launch of their new website and Holiday 2015 collection! 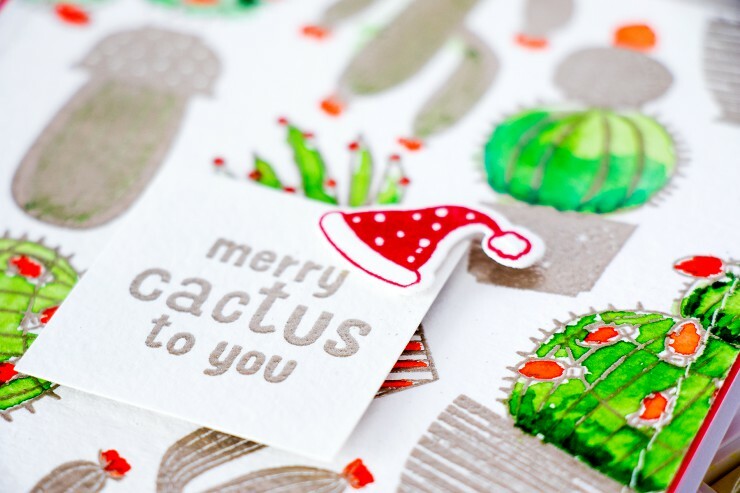 I have been in a holiday mood for that past couple of days or I should probably say weeks and I been dying to make a card using a new stamp set by Hero Arts called Merry Cactus To You. We always have Christmas trees, ornaments, reindeer, Santa but rarely or probably never have a cactus on a holiday card. So today I’m using a cactus stamp set to create 2 simple heat embossed watercolor background holiday cards. I’ve shared a video recently where I used rather large images to stamp a background pattern on a full letter sheet and create 4 cards, today I’m going to follow the same concept and use large images, well not as large as I used in that video, but still slightly larger than the images I usually use to stamp a full background. I’m going to be working on a half of a letter sheet piece of paper, so its going to be enough to make 2 background for standard A2 cards. Please watch my video below or on my Youtube channel for more tips and tricks and a detailed tutorial. Thanks! I’ve used Hero Arts new Platinum embossing powder for my heat embossing (had to change things up a bit from the usual gold). I mixed and matched solid and also outline images for my cards because I wanted to add a little bit of watercolor to these. I intentionally did not use just solid or just outline images. If I were to use just outline images and would have water colored all of them I would have had a background that is a little bit too busy. And if I were to use just solid images I wouldn’t have had any room for water color. 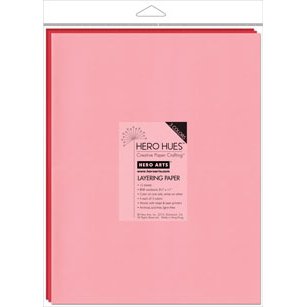 Hero Arts will be giving away one GRAND PRIZE $100 Hero Arts shopping spree. The winner will be randomly chosen from all of the blog hop comments received by 11:59pm PST on Tuesday, September 8th. Check the Hero Arts blog for the announcement of the winner. 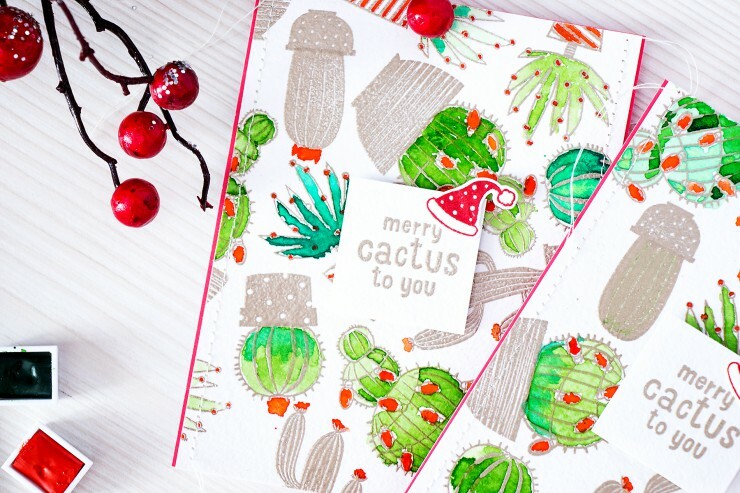 I must say I am not a big cactus fan, but you rocked these Christmas cards! Thanks for sharing a new idea! Super cute cards! I love the background and stitching. Thanks for sharing. The cards are cool and they look fun at the same time! Such a fun card! Love the mix of neutrals with red and green! Love how you used the cacti as your background. Fun! Fun! How much fun can one person have with stamps like cactus’s! Surely me! Love these fun cards on the hop ! All cards have been a delight to see! Wow…what fun and cheerful cards. Thanks for sharing them and also thanks for a chance to win! I love the Merry Cactus stamps and die cuts! Great cards. Totally love this care, so fun! Totally love these cards, so fun!! I love the embossed areas with the watercolored areas! Perfect combo and not to busy this way! Those are some fun, fun cards! love the addition of the water coloring to these stamps. adds much more interest having half full embossing and the other half embossing plus color. Love your cactus background embossed and watercolored. I can see I “need” some platinum embossing powder. TFS, Yana! This is a cool background technique. Wow, wow awesome cards love those cactus and that great background. What fun cards, so unique for Christmas, Yana! Being from Pennsylvania, i kind of love how untraditionally Christmas this is! Your marry cactus cards are inspiring. This set is perfect for someone who wants to send something different this year. Cute – cute cards and what a wonderful video – you do such a great job!! 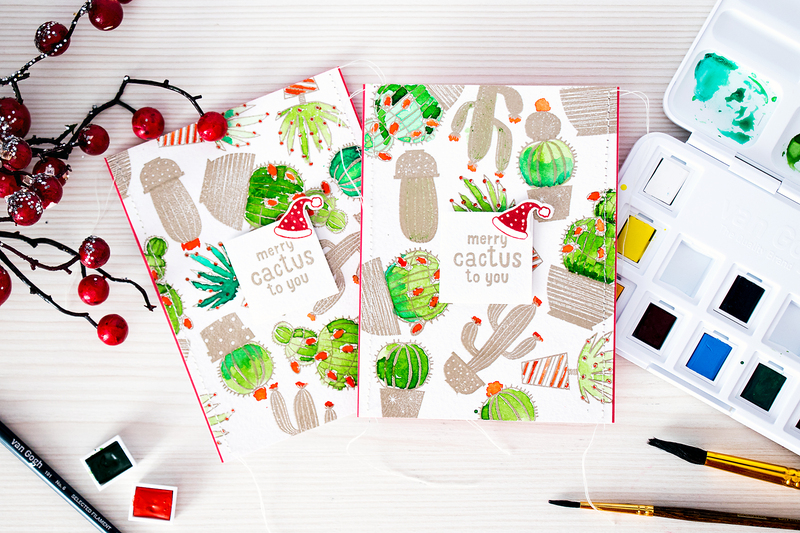 I just love the bright & cheerful colors of your adorable cactus cards. Very fun with all the cactus. Love your cactus card. A very good idea. Thank you. I love the cactus stamp set! Your cacti cards are sweet! 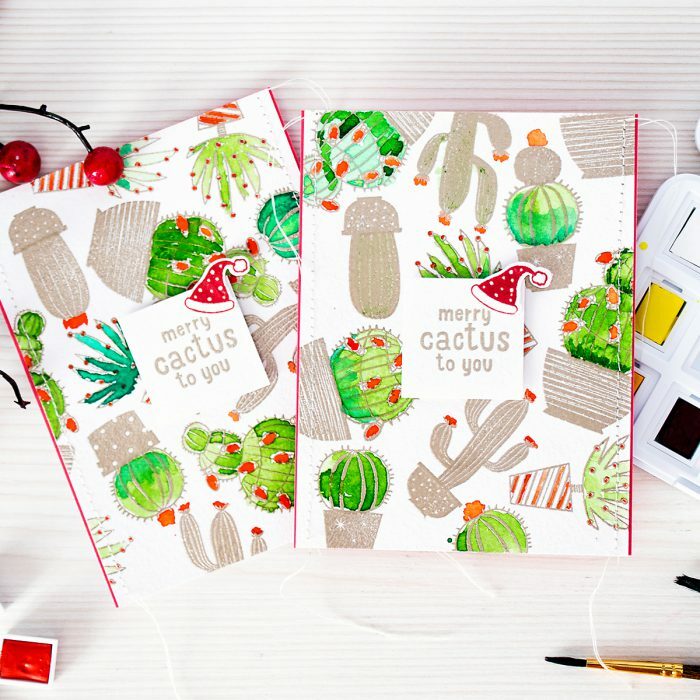 Love the cactus stamps and your choice to use water colors to decorate them. It looks so fresh.thank you for the tutorial. 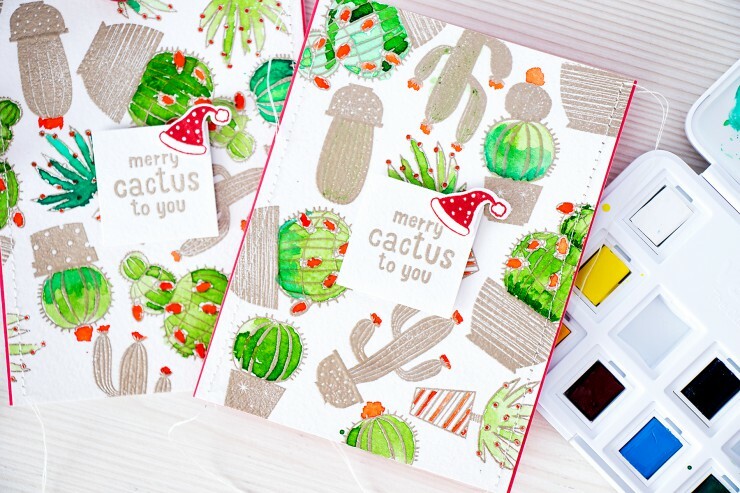 love your cactus card – it is so fun!